Now that you have decided to start a cattery and your boarding cattery is ready, you will be keen to start trading. Your plans have been approved and you have your licence. Everything is ready to go, so what cattery supplies are essential and which are nice extras. You should buy one litter tray for each pen/chalets that you have plus at least half a dozen spares. There are several different styles and size of litter tray. One of the best has a lid that fits neatly over the tray with no catches or fastenings. The more nooks and crannies your equipment has the harder it will be to keep clean and disinfected.Some cats will not use a litter tray with a lid in which case you would need to remove it. Heating for the cats in the winter months is essential, you might have the luxury of a heated cattery, but if not individual heated pads are the answer. They must have a safety cover over the cable to prevent the cats from chewing or damaging them. There are different types of heated pads. Some are quite soft and flexible with vinyl cover which are easy to wipe. There are others that are rigid, made from metal, these are hard but can be covered with a small blanket or towel. The flexible ones are probably nicer for the animal, but they are more easily damaged by the cats and might only last a season. At over £25.00 each you might be well advised to use the rigid kind. Water and food bowls are another essential, you will need at least two water bowls per unit (changed daily) and at the very least two feeding bowls per unit. Feeding bowls particularly have to be washed and disinfected after use. You can use disposable feeding dishes, these do cost a few pence each but for a busy cattery they are a godsend and minimise the risk of cross infection. Another item which should be considered vital is a pair of leather gauntlets. If you need to handle a difficult cat these will protect your hands and arms from bites and scratches. Naturally you will need a good stock of cat food. 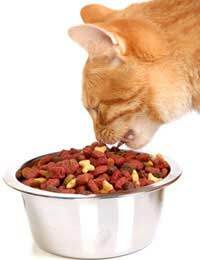 When purchasing your cattery supplies try to get a good selection of cat food brands. Many catteries feed only dry food. In the summer it is wise not to leave wet food down all day, far better to feed a small amount, remove the bowls after an hour and leave dry food for the cats to eat during the day. There are many brands of litter on the market, some are wood based and others are clay or even paper based. It is up to you which you choose. You will need metal bins to store the dry food in and secure cupboards for the tinned food. You will need brooms for sweeping, scrubbing brushes, buckets and disinfectant. There are special brands of disinfectant for use in catteries. You need to be extra careful with cats as they wash their paws, and will ingest any liquid that they might come into contact with. Anything that makes your working life easier is worth considering. A stainless steel trolley for keeping the cats food on as you move between the pens/chalets. These will cost a few hundred pounds but can save all the back and forwarding to the food preparation area at feeding time. A cleaning trolley called a 'janitor' will make it easier to keep all your cleaning equipment together. Last but not least a supply of towels, toys and catnip will all help to make your cattery a pleasant place to work. Hello at the moment I have got chickings in my garden but when we nolonger have any, I'm going to start from scratch with my mum to buy, build and watch our own cattery be brought to life with nice clean pens and warm heat pads for all whether!! I'm so excited if Evan made my own busness card witch I'm going to a profetinal card maker so I will be very prepeard!!! So would you be able togive me some tips and tricks? Does Someone Have to Be on the Premises at All Times? How to Manage Waste From Litter Tray in Rural Area? Should we Separate the Cattery From the Mortgage? What If a Cat Dies While Boarding at Your Cattery? Do You Need Staff For Your Cattery?